The ALD-E Series offers DALI dimming interface with dimming range from 1%-100%. High efficiency to 95%, small size for easy installation, 40.6(L)x23.5(W)x10.1(H)mm and 59.80(L)x34.01(W)x16.40mm(H) for T type. The operating ambient temperature can be from -40℃ up to 80℃. Compliant with EN55022/EN55015 Class B, EN61547, and EN61000-4-2, 3, 4, 5, 6. The input voltage is from 11VDC-50VDC and the output voltage is from 8VDC-45VDC. For 1400mA version, the input voltage is 11VDC-40VDC, and the output voltage is from 8VDC-36VDC. There are different output currents: 350mA, 500mA, 700mA, 1050mA, and 1400mA. Three different output types: PCB mountable, wire out, and connector type. 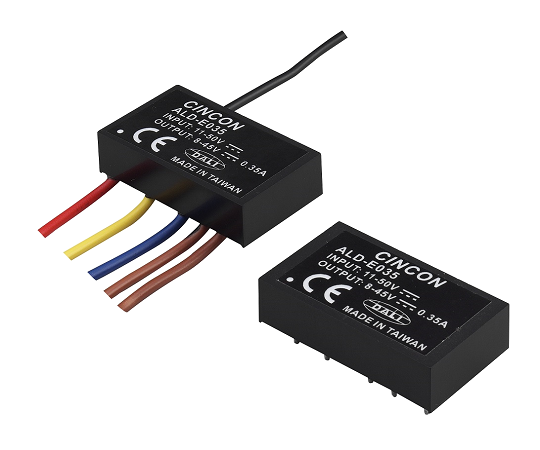 It has short circuit protection (constant current with auto recovery) and the protection when the voltage difference between input and output is larger than 20VDC. IP65 for model: ALD-EXXX、ALD-EXXXLW. IP64 for model: ALD-EXXXT. ALD-E is suitable for power module of LED lighting. In addition, it can be applied to track light fixtures especially for DC bus application, downlights and panel lights.